It’s a story told throughout the West. At one time, Silver City was the Owyhee County seat and the center of mining in southwest Idaho. As the mines played out, it became a ghost town. 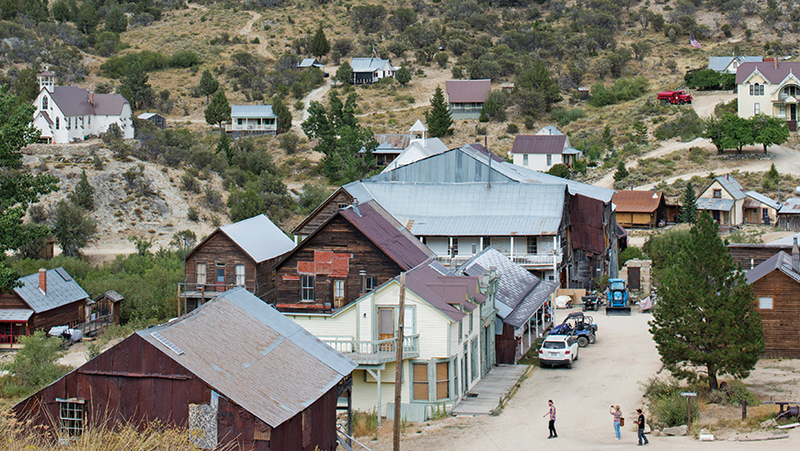 But unlike many ghost towns of the Old West, Silver City is finding new life as people buy and restore the 19th-century buildings and even equip them with solar power and Internet connections. Like so many places in the Old West, mining became the dominant industry in 1862, when silver and gold ore were discovered on War Eagle Mountain, in the Owyhee Mountains. (“Owyhee” is an early spelling of “Hawaii”; several early expeditions around the Pacific Northwest included Hawaiians, and a number of locations in the area are named Owyhee.) Silver City itself was founded in 1864 and became the county seat in 1866, when its population was around 5,000. As the saying goes, there’s two ways to make money in mining, the second being supplying the miners. To get his share of the riches, Nampan William Dewey decided to build the Boise, Nampa & Owyhee Railway, a 30-mile line beginning in Nampa to serve Silver City. As part of that, he built the Guffey Bridge, now located at Melba’s Celebration Park. But mining in the area collapsed by 1912, and the railroad to Silver City was never completed past Murphy. While freight service continued for the farmers in the area until 1947, the tracks now terminate at Melba and the remaining line was torn up. Silver City also spawned Idaho’s electrical industry. Swan Falls Dam, up the Snake River, was built in 1901 to provide electricity to the Silver City mines after the area ran out of wood for fuel. The three-phase electricity used by the dam was the testing ground for modern electricity because the alternating current advocated by Nikola Tesla was better able to traverse the distance between the dam and the city than the direct current supported by Thomas Edison. Like the railroads, the electricity had only recently become available when mining stopped. After the mines played out, Silver City’s population diminished. The county seat moved to Murphy in 1934. While electricity continued to be available until the 1930s, at that point the system was shut down so the electrical equipment could be repurposed. For many Western ghost towns, the story would end there; the buildings would gradually collapse in on themselves, salvageable materials would be filched, and soon the town would be nothing more than a memory. But Silver City was different. For one thing, it also managed to escape the ravages of fire, which destroyed many a wooden mining town. And some families already settled there stayed. Silver City has also managed to escape the ravages of commercialism. This isn’t like Nevada’s Virginia City, with its Bucket o’ Blood saloon, prostitution museum, and people dressed in period costume. Silver City is more like a summer place, with just three businesses: a hotel/restaurant and two gift shops. And while the city gets plenty of tourists—particularly during its annual Open House weekend, typically two weeks after Labor Day—it’s not a tourist trap, residents said. To buy a house in Silver City, first you have to find someone willing to sell one. “Houses don’t come up for sale very often, and they’re usually grabbed fairly fast,” typically $47,000 or $48,000 for a house that needs a lot of maintenance, Orton said. “Silver City’s unique,” he added. “We really don’t want it ruined by commercial development. 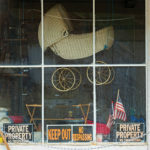 We want it to be a real, authentic Western town people can come into, and walk down the streets, and get a feel for what it was like in the 1800s.” His grandmother, for example, raised eight children using only wood for heat, he noted. The city does have some modern conveniences. Several 19th-century wooden buildings are incongruously topped with solar panels, some just for lights, others with more. “I can run a microwave, a coffee pot, a hair dryer, a curling iron, and a vacuum,” Orton said. “Not all at one time,” he amended. His refrigerator, stove, and heaters run on propane. Paul Nettleton is a cattle rancher and provides historic rides in the area. Orton acted as the watchman one year until March 1 and was completely alone for six weeks due to rainstorms that washed out the roads. “I had enough food,” he said. “I had a lot of dry goods and frozen foods, and for myself, I didn’t need much.” Even with snowmobiles, it can be hard to get into Silver City in the winter due to snowdrifts on the summit. “I like the winters here, and get here as much as I can,” he said. Silver City is between Murphy, Idaho, and Jordan Valley, Oregon, and you can reach it from either side. All-wheel or 4-wheel drive is preferable but not required. From Murphy, take 78 South, turn right on Silver City Road, and it’s about 20 miles on a dirt road. From Jordan Valley, take Yturri Boulevard to Trout Creek Road, and it’s also about 20 miles on a dirt road. Roads are typically open from Memorial Day weekend into early October but can be muddy if it rains. As in any off-road travel, check for wildfires before heading out, make sure people know where you’re going, gas up, and take water and food. And dress appropriately for the weather—19th-century mining towns didn’t have air conditioning, and Silver City doesn’t, either. “My air conditioning is, open the window,” said Clarence Orton, the third generation of his family to live there.